The genus name Plantago derives from the Latin planta, "sole of the foot," in reference to the broad leaves. The common name psyllium derives from the Greek word for flea, psylla, in reference to the appearance of the tiny seeds. Psyllium is an annual herb native to western Asia, northern Africa, and Europe. It grows from 12 to 18 inches tall. The opposite leaves are linear or lanceolate- linear. The numerous flowers are small and white. The seeds are enclosed in capsules. The plant prefers cool, dry conditions with plenty of sunlight and well-drained, sandy loam. Psyllium is valued for its mucilaginous and laxative properties. It absorbs up to ten times its weight in water. Its fibrous qualities makes it an excellent laxative, but it also provides intestinal bulk, which can stop diarrhea. Because the seeds tend to swell and create a feeling of fullness, they can help curb appetite. Psyllium is used in the treatment of acid indigestion, autointoxication, colitis (ulcerative), constipation, Crohn's disease, diabetes, diarrhea, dysentery, hemorrhoids, high cholesterol, irritable bowel syndrome, obesity, and ulcers. Topically, psyllium can be prepared as a poultice to draw out infection, relieve toothache; it is used to treat abscesses, boils, skin irritation, and whitlows. It can also be prepared as a soothing eyewash. 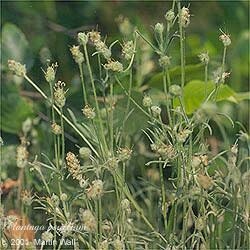 It is sometimes used as a binder for other herbs in poultices. The seeds and young leaves are edible. The seeds are usually ground before consumption. Psyllium can be prepared as an emollient facial mask. Psyllium can dilute digestive enzymes and is best taken between meals, especially before bed or first thing upon rising, rather than with food. Always drink plenty of water when using psyllium, or else it can cause, rather than relieve, constipation.